Random Anny .Com: Cirque Tickets 75% Off! I am so glad I didn't work today! Cirque just e-mailed with a 75% discount on tickets to their upcoming show Ovo! My roomy and I were discussing going earlier this week and I am so glad we didn't book them at the $69 (for the CHEAP seats) price! Click here to reserve your tickets! This show is being held at Randall's Island, which is my all-time favorite Cirque venue. They set up their own tent so are not limited by a building's size (which happened when I saw them in Newark last year). See that picture? 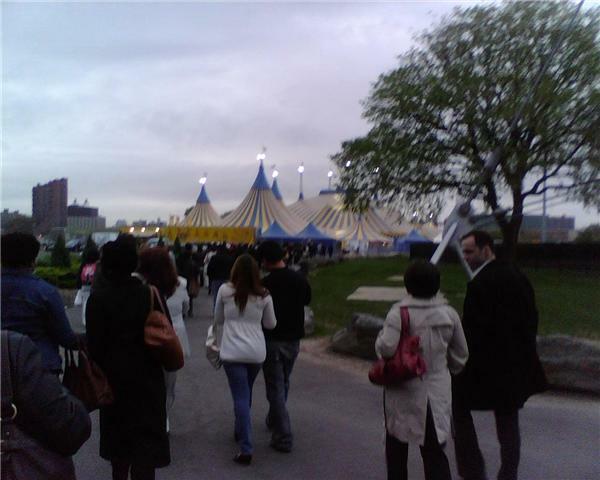 That's us walking to the tents where the show was being held. Soo jealous! My sister in law went to Mystique in Vegas recently and looooved it.